It sure *looks* to me like another reason to use hand tools. 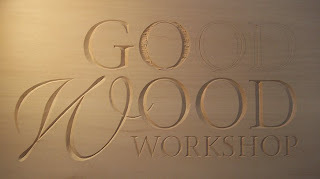 Your work-in-progress sign looks absolutely beautiful, with all the curves and perfect carving! Is it now finished? May I commend you on an excellent tutorial on an often overlooked technique. Your photographs are excellent and your nails are well kept. I agree with Stephen - you never would guess you were a wood worker with those hands! You could just pay someone to do it for you, as well. LOL! Yes, Wyld, that certainly would be another option. I'm looking forward to more post on the subject... Very interesting, thanks for sharing. Thanks, Luke! I'll try to post the next one this weekend. I'll have to see if my "photographer" is free. Please save me from fruitlessly searching the internet and tell me what font you used for that beautiful script W on your sign. Mark H, the font is Shelley Volante BT. Very well done, nice clean cuts. Nice tutorial. What type of carving tools did you use receomend for this type of carving. Todd, I buy Lamp brand carving tools from Woodcarvers' Supply. They're thin and do not have side bevels—perfect for this type of carving. Great tutuorila thank you. Complete beginner here. Just wondered what type of wood you used as it looks like carving into butter, yet it holds the letter shapes perfectly. Thank you, Mark. I'm carving basswood, which carves very easily. Sometimes the wood is spongy, though, and does not hold an edge well, so look for boards that seem harder. Other woods that carve well are butternut and mahogany, but I've also carved cherry (a little harder) and Swiss Pear (a lot harder, but holds a crisp edge). 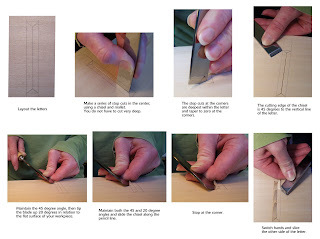 You might also like chip carving which also allows you to carve letters. I've found that it's a wee bit easier than using chisels and gouges. 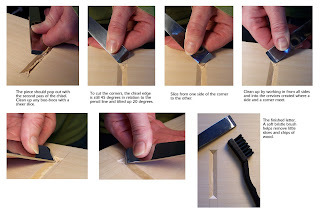 If you do a search for "chip carving" on my blog, you'll find a couple entries, including a video tutorial.